On Friday evening after setting up to observe, I could see sky conditions would be better than average for this time of year( late fall). 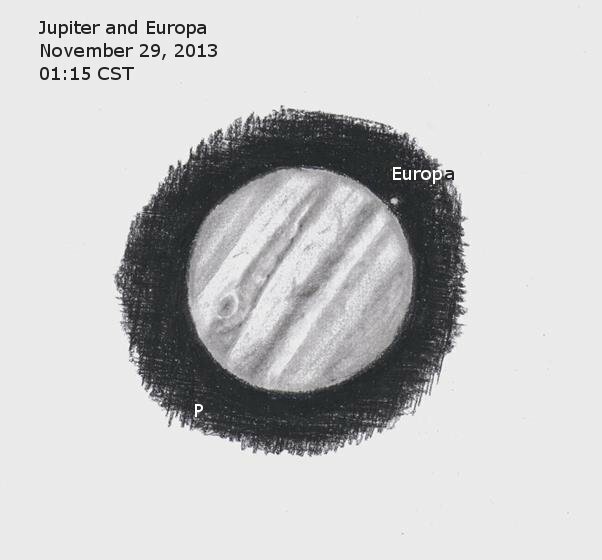 When Jupiter climbed to more than 60 degrees above the horizon, I realized that this would be the night to make a first sketch of Jupiter for the season. The GRS was redder than last season especially in its center and was well set apart from both the South Tropical Zone and South Equatorial Belt. Europa had just emerged from behind the North Tropical Zone on the following side of the planet. A couple of festoons could be clearly seen in the Equatorial Zone emerging from the North Equatorial Belt. It was right at my tolerable cold temperature limit for sketching and I finished before needing to retreat indoors to warm up. On a steady night of good seeing this is the time to give Jupiter a look. Once more, you have done a wonderful sketch, the details are so subtles with no contrast exaggeration that we feel, looking through a perfect giant telescope. Thank you both for these very nice words. I can assure you both that you would have done better with the same instrument and your sketching abilities. Thanks for the interesting Info`s!! I saw Jupiter so detailed and so nice only one time in my life. You are a great observer, we can see! The Jupiter shows us many interesting details.